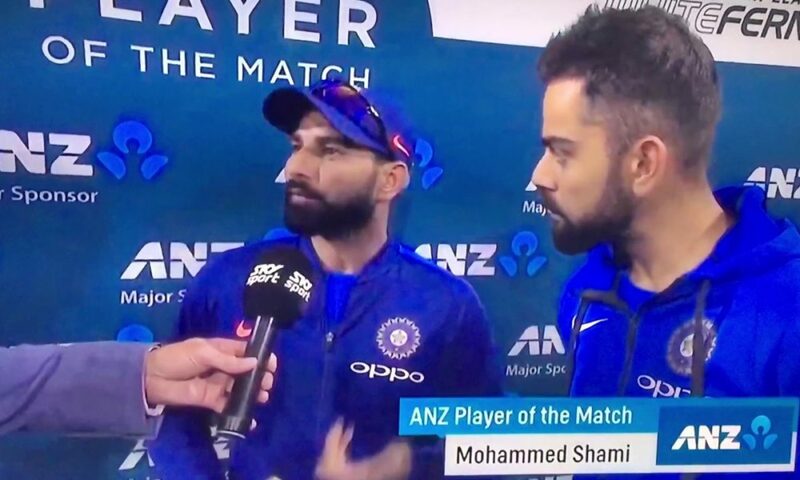 Shami Tried To Communicate In English Himself In Post Match Presentation !! Host Simon Stunned !! India with its dominating performance made a clear 3-0 series win against New Zealand on their home soil on Monday. After registering a comfortable 7-wicket win, Kohli became the first Indian captain to win back-to-back ODI series in Australia and New Zealand. The match was nicely set up for the Indian team by the bowlers led by Mohammed Shami, who finished with 3 wickets for 41 runs. Bhuvneshwar Kumar, Hardik Pandya and Yuzvendra Chahal bagged two wickets each. Winning the Man the Match for his bowling performance, he was called to speak along with skipper Kohli as his translator. 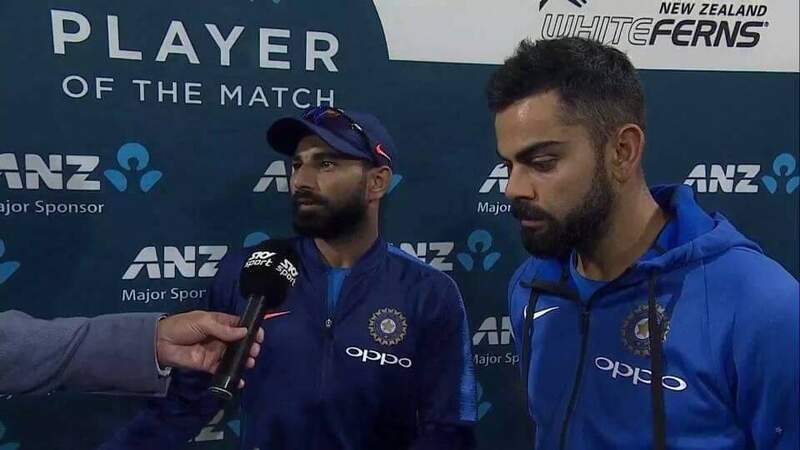 The pacer had needed Kohli’s help in Napier where he answered the questions in Hindi which the captain translated in English. 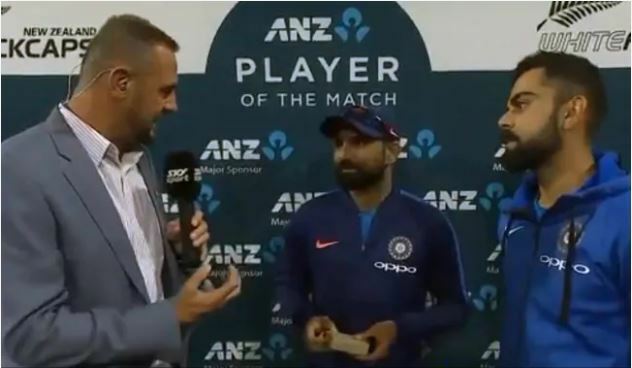 However Shami – who is known to bowl people out in style – took everyone by surprise, especially former New Zealand fast bowler Simon Doull who was conducting the presentation. Shami decided to go for it and said, “It’s really difficult to bowl against the wind. One comes with the wind and the other is against the wind. It is difficult but not too hard. Bhuvi at the other end was also a great help. Sticking to areas where we want to bowl is the key”. Doull was so impressed with Shami’s effort that he complimented him in Hindi. He said, “Your English bahut acha, congratulations,” making everyone burst out into laughter. Wtf was that😂 why he came with virat when he wanted to speak in English? That’s a real brainfade. *Shami back to having a nic of picking up wickets in every match. *Pandya stunning catch! !and his 2-45 after his return. *Contribution from all the top 5 batsman. After Simon’s compliment, Virat laughed with pride and gave a pat to Shami while leaving the presentation. That is one way of showing his sigh of relief ?? Comment your views on this !! Previous articleMan Asked Chinmayi To Wear Saree !! Chinmayi Responded With A Shocking Reply !! Next articleBlue Satta Replied To The Allegations Against Him In “Kaala Style” ?? Check Out ! !